The City of Johannesburg is holding its inaugural council meeting, with councillors having been sworn in. Follow the live updates here. Mashaba looks forward to working with EFF, he tells eNCA. He says council workers in Joburg needn't worry about their jobs - as long as their work is up to scratch. The council meeting has now adjourned. Mayor Mashaba takes to the podium. He thanks all those around them. That wasn't Mashaba's inaugural speech. He felt it inappropriate given the death of ANC Councillor Mthembu. Let me not subject you to a long speech, Mashaba says. We're going to bring change that will create jobs. We need to address 1 in 3 who don't have jobs. Our govt needs to create enabling environment. Small businesses, you will be my biggest friends. Mashaba sends condolences over loss of ANC councillor Nonhlanhla Mthembu. BREAKING: Herman Mashaba announced as new mayor of the City of Johannesburg. Chief whip: Kevin Wax of the DA wins it. 269 valid votes cast. None spoilt. Elections were free and fair, says IEC. Speaker Da Gama about to make announcement. Councillors take their seats. Yes, we're still waiting for the official announcement. Da Gama says they still waiting for all results so they can announce chief whip and mayor all in one go. Looks as if counting is still continuing. Speaker Da Gama asks members to take their seats. Singing continues. The ANC in Gauteng is deeply saddened by the sudden passing on of our comrade Nonhlanhla Mthembu, fondly known as Black Diamond and Stompi. She collapsed during the City of Joburg’s inaugural council meeting held earlier today to elect Johannesburg Mayor, Speaker and Chief whip - following the 2016 Local Government Elections held earlier this month. Ms Mthembu who recently celebrated her 50th birthday was an activist at heart, and a longstanding member of the ANC. She had devoted her life to serving her community. She was a Johannesburg councilor in the 2011 - 2016 term of office, and was re-elected to serve for another five years. The cause of her death is not yet known. We send our deepest condolences to Cde Mthembu’s family, friends, comrades and colleagues. May her soul rest in eternal peace. Whoa. Tensions rising in the house. Police officers break the scuffle apart. Mashaba walking around shaking hands. Councillors start taking their seats whilst singing and whistling carries on. Whoops, cheers, celebratory singing as a beaming Herman Mashaba held aloft by comrades. BUT, no official announcement yet! EFF and DA members singing heartily, though results haven't been announced yet. Voting is now complete for the mayor and chief whip positions in the Joburg council. Counting is set to start. Voting is said to be near completion in Joburg... We eagerly await. Tshidi Madia explains why ANC councillors are leaving after voting: Their colleague passed on during the sitting. Council agreed they can vote and go. Voting for both Chief Whip and Mayor gets underway at Joburg council meeting. 269 councillors will be casting their votes. Nominations for Chief Whip are DA nomination Kevin Wax and for the ANC it is Solomon Mogase. Condolences from councillors to the ANC for the sudden loss of their member. "We've had a tragedy in the African National Congress," ANC councillor Jeff Makhubo tells council, voice hoarse. Reports of interesting developments here at the council sitting. Hearing that the councillor who fell ill has died, News24's Tshidi Madia has tweeted. Waiting for confirmation. Singing, cheering continuing in the chamber. Proceedings haven't re-started yet. Reports of interesting developments here at the council sitting. Hearing that the councilor who fell ill has died, News24's Tshidi Madia has tweeted. Waiting for confirmation. We're coming up to 20 minutes for the 10 minute caucus for the ANC. The ANC gets a 10 minute caucus. EFF member objects to adjournment. He says some of them haven't eaten and are "suffering from illnesses". Maybe the food was finished by the time he reached the front of the buffet line. ANC councillor asks for an adjournment. Due to collapsed member. Da Gama grants request. BUT now there's an objection. It's just the two nominations. 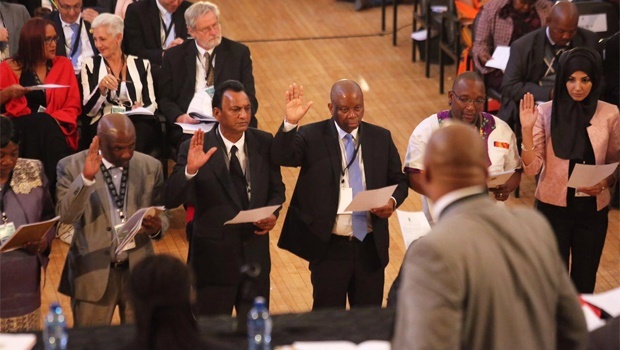 Mashaba accepts nomination. Cheers all round. Herman Mashaba nominated as executive mayor by the DA of Joburg.